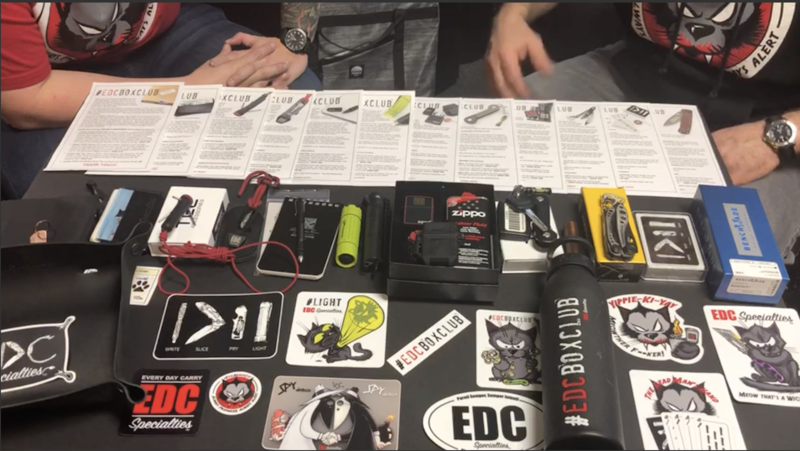 Whether you are new to Every Day Carry or are an EDC pro, our #edcboxclub will be a big hit each month when you receive your subscription in the mail. 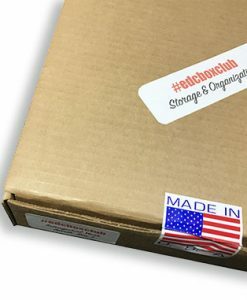 Every box is filled with quality, American made gear and essentials you need to be prepared each day. SAVE OVER 20% OFF RETAIL PRICING when you subscribe for 12 months. Cancel anytime without penalty. Subscriptions beginning after the 15th of any month will receive the next box in the rotation (up to 6 weeks out). 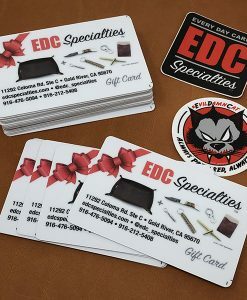 Call 916-476-5094 or email us at info@edcspecialties.com with any questions. For complete information and unboxing videos, search YouTube for #edcboxclub. Items may vary slightly from year to year. 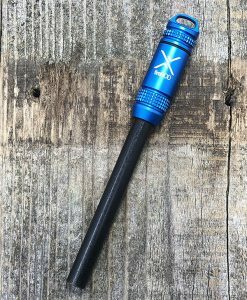 Over the last few months, the #EDCBoxClub from EDC Specialties has graced us with some great gear, ending in a finale that can’t be matched. 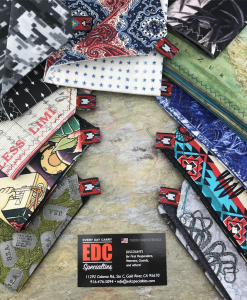 Overall, no other subscription box club can do what EDC Specialties has done over the last 12 months. 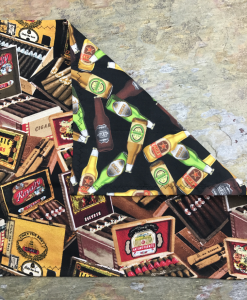 Delivering quality gear, that’ll last a lifetime, all while making sure it is US made. That’s a tall order! 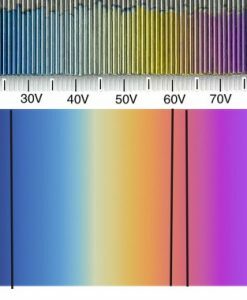 Overally, throughout the lifecycle of the inaugural year, we’ve seen EDC Specialties cover all of the bases. A few namely categories such as pocket tools, writing tools, fire making, and flashlights were covered, making for an excellent setup. In addition to this, some other creative categories such as storage, and multitools were added in to make sure even the more unique areas were taken care of for your EDC setup. Ending the year was obviously special for Rob at EDC Specialties. 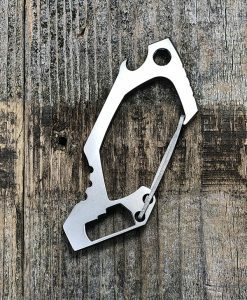 To me, it kind of all began with the Leatherman Skeletool, a US made do-it-all multitool. Admittedly, I carry a Leatherman Wingman as my primary EDC, not the most popular option out there! But since I carry a multitool in general, I was super excited to see not only a multitool, but the US made Leatherman in the box when I opened it up. The Skeletool most prominently features a 420HC blade, complete with serrations, and also has the usual pocket clip, and tough pliers that other Leathermans feature. 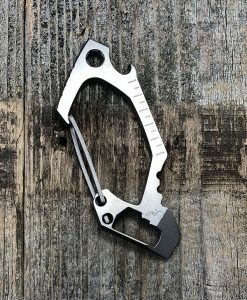 Other than the obvious aforementioned tools, the Skeletool also has an integral carabiner, perfect for hanging on hiking packs, or your belt loops. 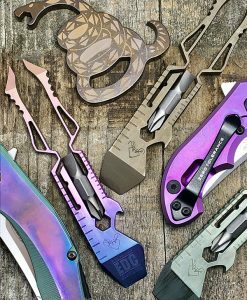 Overall, the Skeletool has a few bit drivers, and a bottle/can opener to cover all of your bases. The pliers have both a robust interior jaw, and a needlenose, as well as wire strippers. For me, this makes for a great multitool. Its not overcrowded, heavy, and packed with useless features. 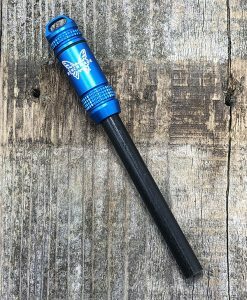 Rather, it’s full of useful tools in a setting that is both lightweight, and strong for rough use. 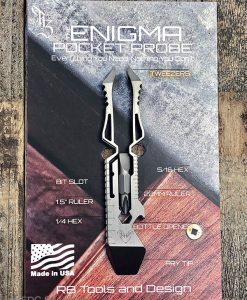 I carry this tool very often now, mostly due to the fact that I grab it from my Jeep’s center console when I forget to put my other Leatherman in my pocket. It’s tightened many rogue loose screws and fasteners in the last few months! Of course, ending the first year of the #EDCBoxClub wouldn’t be complete without a month full of swag. As someone who plasters stickers (cool ones) all over tool boxes and storage cabinets in my garage, I definitely appreciate some comical stickers that become conversation pieces. Rob and team put together an entire swag pack for the second to last box, making for a great representation of EDC Specialties wherever you place the stickers! In addition to the stickers, a custom made set of EDC Specialties playing cards is included – a handy thing to keep in your bag just in case you need something to pass the time with friends! These will certainly live in the camping bag for rainy days in the tent. And last, but quite the opposite of the least, is the grand finale of sorts for the first year of the #EDCBoxClub. EDC Specialties ended the year with a great treat, in the Benchmade Bugout. 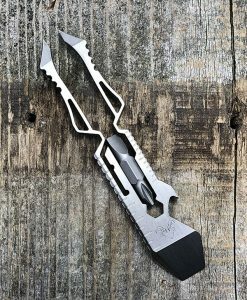 If this isn’t the ultimate EDC knife, I don’t know what is. The bugout is lightweight, features a great pocket clip, and sharp CPM S30-V steel. 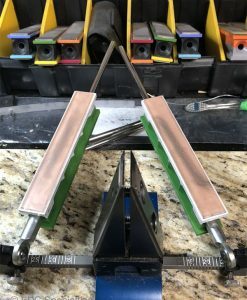 I couldn’t ask for any more in a knife, and of course, Rob has gone ahead and had the #EDCBoxClub’s inaugural year inscribed on the blade. The knife itself features grivory scales, with a nice stippling job for grip. This alone has been one of my favorite features on the knife, in addition to it’s nearly weightless presence. As someone who primarily carries a heavy multitool, it definitely takes some getting used to. I often times forget I have the knife on me altogether! This makes me very excited to use it as a summer carry knife, when I’m usually in lightweight shorts and on the move. Overall, the first year of the #EDCBoxClub was a hit for me! I was super excited personally, to see a company finally take the subscription box game seriously, by giving subscribers things they need and will actually use on a daily basis. A massive thank you and shout out to Rob and team at EDC Specialties!